It addresses the role of liturgy, spirituality and popular piety in culturally diverse Catholic assemblies. Father Juan Sosa understands the challenges of ministering in a multicultural parish. A priest and composer in the Archdiocese of Miami, he's served immigrant communities in South Florida for many years. Inspired by first-hand experiences, his new book is an authoritative and encouraging guide for fellow priests, musicians and other pastoral ministers. 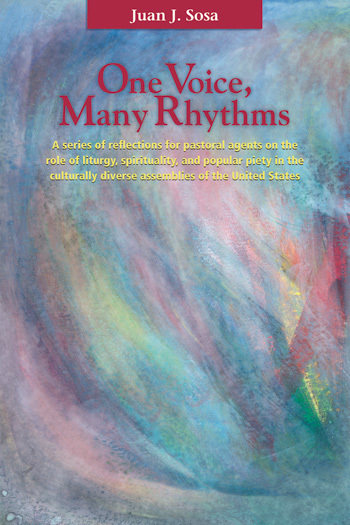 One Voice, Many Rhythms addresses the role of liturgy, spirituality and popular piety in culturally diverse Catholic assemblies. Drawn from his extensive work with parishes around the country, the reflections cover the future of liturgical texts in Spanish, the unifying power of music and the sacraments, and more. "Accept one another as a 'communion of believers'"
"I am delighted to see this dialogue among the many cultures that shape the multicultural reality of this nation," he states in the conclusion. "The exploration of a true, authentic inculturation, however, cannot take place unless the local communities accept one another as a 'communion of believers.'" That communion is Father Sosa's ultimate goal. The book closes with a charming anecdote. About ten years ago, he was assigned as a chaplain on a Caribbean cruise. After visiting a priest friend in Venezuela, at a port of call, he returned to the dock only to see the ship on the horizon, sailing away. "Stranded, undocumented, at the mercy of others"
For two days, he was "stranded, undocumented, at the mercy of others, dependent upon [the] Church." The incident expanded his awareness of -- and compassion for -- those who face similar challenges on a daily basis in our country. From that moment on," he could not ignore anyone who knocks at the door. Scholarly yet accessible, One Voice, Many Rhythms makes enlightening reading for all who serve and worship in multilingual parishes in the U.S.
A festschrift in honor of Rev. Virgil Funk, founder and president emeritus of NPM, The Song of the Assembly gathers 23 thought-provoking new essays on music in the liturgy. Contributors include noted liturgists, composers and clergy, among them Nathan Mitchell, Benedictine Fathers Columba Kelly and Anthony Ruff, J. Michael McMahon and Bob Hurd. Each essay takes as its starting point a particular Church document on music and liturgy published in the past 100 years. The latest release in the Studies in Church Music and Liturgy series from Pastoral Press, the book will be released in summer 2007 on the occasion of Virgil Funks 70th birthday. Today's ministers of hospitality (or ushers) do much more than hold doors and hand out bulletins. This new book, the latest in OCP's Basics series, explores every aspect of this ancient, essential and noble ministry. Written in essay format and organized by topic, the book answers the most common questions and covers the history of the ministry, the normal patterns of celebration, the minister through the liturgical year, and the relationship between these ministers, presiders and musicians. But the book goes far beyond spiritual and liturgical subjects. It also offers practical advice on modern issues like parking, cell phones, cry rooms, first aid, security, and room temperature. Other sections cover accessibility for people with physical challenges, multicultural issues, and interfaith/ecumenical celebrations. The authors are both widely published liturgy experts. The former manager of OCP's Liturgy.com, Glenn earned his sacred liturgy doctorate (SLD) from Sant Anselmo in Rome. Michael is co-author, with Glenn, of Parish Liturgy Basics, Revised Edition. The book also includes wisdom from the late Sulpician Father Eugene Walsh, known for his numerous writings on liturgical renewal. In a sense, we're all ministers of hospitality -- in and outside church. Welcoming is a fundamental Christian attitude and activity. So while the book is an especially good resource for clergy, ushers and pastoral musicians, all who join in communal worship will benefit from its insights. An essential guide to an unsung ministry, Hospitality Basics deserves a place in every parish library.